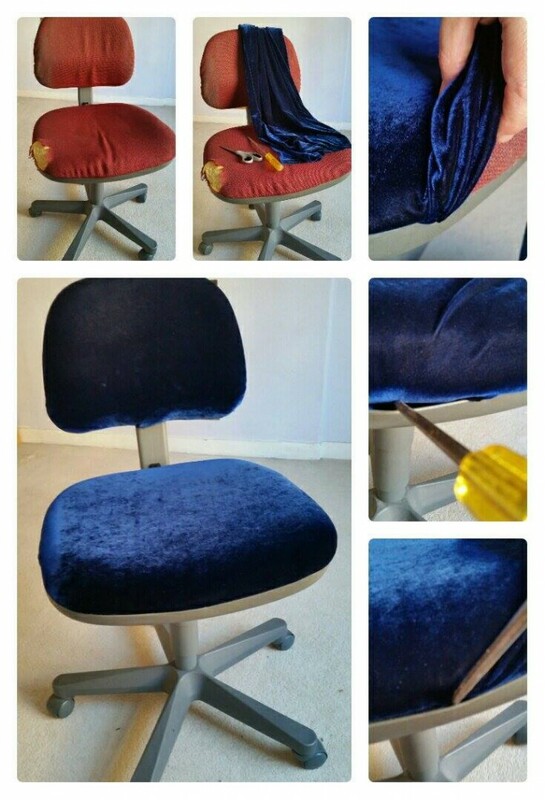 OK – this was one super scuzzy office chair. I obviously have some nervous scratching foam picking tick on my right hand as well… that chair did not start out that way. When I was considering reupholstering the chair before I had been put off at the thought of taking the chair apart and figuring out how to put it back together. I was going to chuck it out until a googling youtube videos pointed me in the direction of a a screwdriver and no need to take chair apart! All you need is some material to cover with (in this case a fabulously luxurious long velvet skirt bought in Paris many years ago and no longer worn). Next, cut the material to an appropriate size (not measured just laid over and cut leaving enough extra to tuck in. This material had some stretch to it as well, so pretty forgiving. Then its just a case of levering open and pushing the material in between the cushion and chair base. Update: Having sat on this for a good few months, the only mistake I made was not to cut enough material for the seat section. A couple of extra inches would have been better. The tuck in at the back of the seat is a little short and slowly comes out over time. Easily pushed back in, but if more material would have stopped it slipping out.